Here’s the latest commission I’m working on. This style I call my storybook style. I first began drawing this way to illustrate a make-believe world for my friends and I. I usually like some sort of mischief to be happening in these paintings. It’s a very sweet and whimsical way of seeing the world. 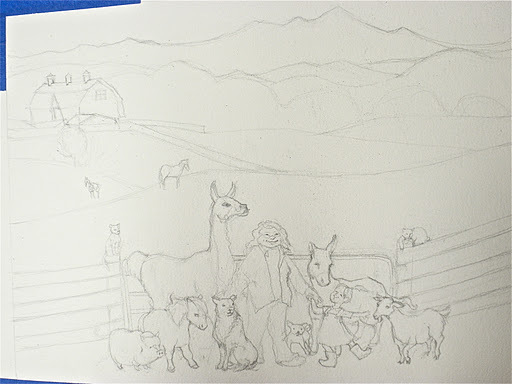 The portrayal is my hiking partner with her daughter and the animals that she works with. She works with kids with behavior issues and the animals are her therapy tools. The painting is a gift from her mother. This also happens to be the farm across the street from my house. I have big plans for the background. I plan on a beautiful Asheville fall scene. I’ll keep you posted as a finish this up.